With Nita’s Pumpkin Carving Portraits Online Course you will be delighting others with your recognizable pumpkin portraits. FREE BONUS Watermelon Portraits ($24.95 value). Certification Available. Now you can WOW your friends and neighbors will astonishing and totally recognizable portrait carvings at any time of year. And, you don’t have to be a skilled artist to carve faces well! You’ll see why in my lessons. Carved portraits are a great way to honor your loved ones (and clients) on their birthdays, for weddings, promotions, retirement parties and more. Pumpkin portraits in the fall and early winter and watermelon portraits throughout the summer. The lessons in this course have something for every skill level – beginner, intermediate and advance. The lessons start with easy portraits and progress to intermediate and advanced portrait carvings. Both Watermelon and Pumpkin Portraits can be lit with external light or lit from within with a light inside the watermelon. 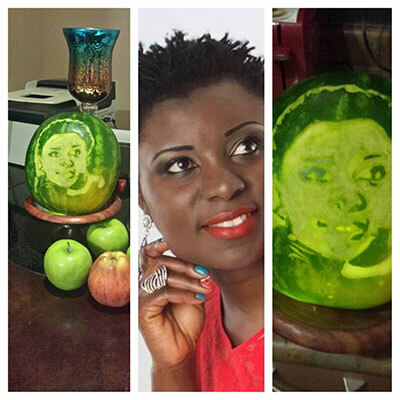 These photos show you how watermelon portraits can look in various lighting conditions. 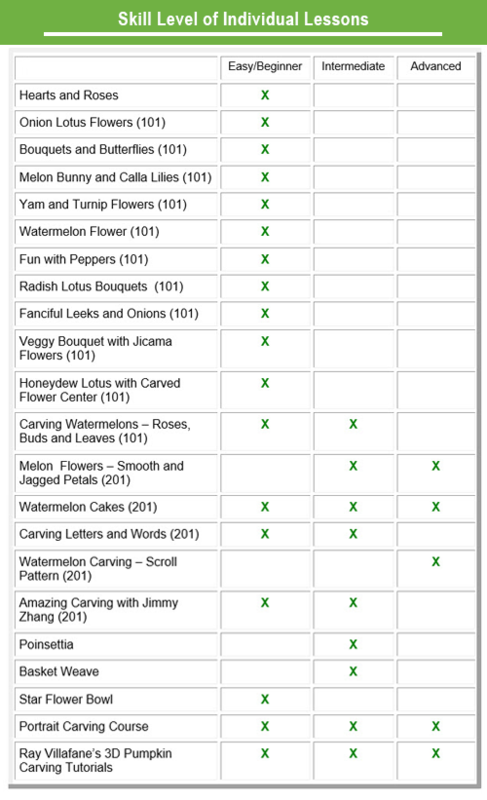 With my Portrait Carving Course you can be carving wonderful, impressive portraits as soon as you can get your hands on a pumpkin or a watermelon. Learn now and your skills will be useful all year long. Imagine having your whole family of pumpkin carving portraits sitting on your front porch for Halloween. 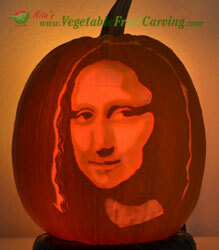 But, pumpkin portrait carvings are not just for Halloween! Imagine honoring special guests at celebrations with pumpkin portraits of them. Imagine having a wedding centerpiece of a bride and groom as a centerpiece for an autumn wedding. If you throw parties or are a caterer, you’ll be able to offer something completely different and exciting at your events. You Don’t Have to be a Talented Artist! I can’t draw well, can you? Fortunately, to make wonderful recognizable pumpkin portraits, you don’t have to be able to draw. Really! This Einstein portrait is also an example of a multi-toned portrait that you will learn in lesson #4. 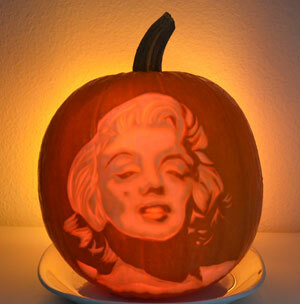 If you can follow the dots, trace, or paint by numbers, you can carve recognizable pumpkin portraits. It’s really not as difficult as it may seem, once you know how. Your friends will be amazed! I guarantee ooohhs and aaaahhhs and exclamations of delight. You’ll see. Besides showing you how to carve, in my Pumpkin Carving Portraits video lessons, I’ll be showing you exactly how to choose photos to make your pumpkin portraits. And, you will learn how to take photos that will make excellent pumpkin carving portrait patterns. Won’t your guests of honor be delighted when they see the pumpkin portraits that you carve for them? “I am so surprised at how easy you make it look. I always think I couldn’t do that then I listen to you and suddenly it all seems so easy. I’ll show you exactly how, step-by-step, from start to finish. 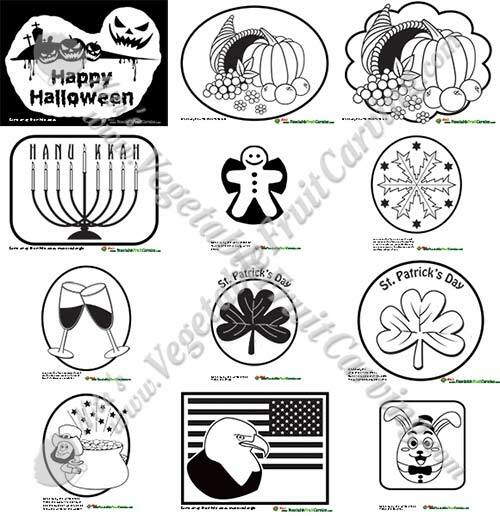 I’ll show you how to change your photo into an easy to follow pumpkin carving pattern using a free software. If you already have PhotoShop, you will also see how to make your pattern using it. You will need access to a computer and printer. Easy 2 tones portrait and easy ‘cheaters method” 3 tone portrait. 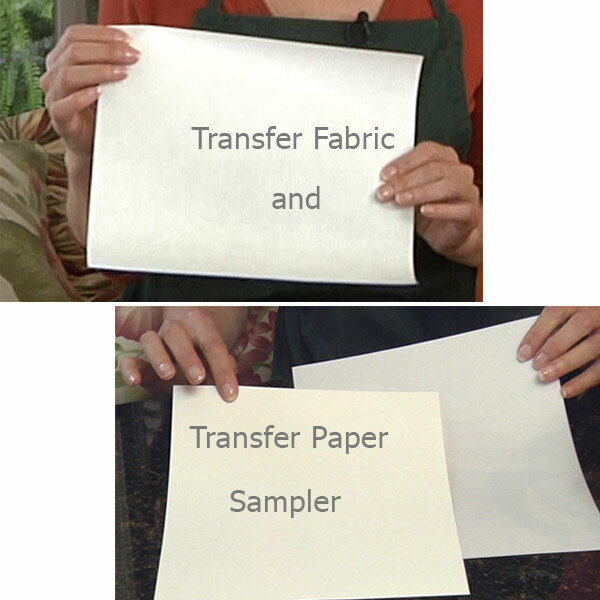 I’ll show you 6 different ways to transfer your pattern to your pumpkin. Then I’ll teach you how to carve it. I’ll show you exactly what tools you will need and most all of them are easily available in craft stores, Halloween stores, drug stores and even some grocery stores during the Halloween season. With my online lessons, you can get started today. No waiting for your DVDs to arrive. For Beginners to Advanced Carvers – 4 levels of lessons included. The lessons start with beginner lessons and progress to advanced pumpkin portrait carving. For beginners, we will start with an easy 2 toned carving. In that first lesson, I’ll introduce how to add shading effects that give a 3 dimensional look to your lit pumpkin carving portrait. The second pumpkin carving lesson will show you how to create a more advanced pumpkin carving portrait with varying shades of light and dark. And, I’ll show you a faster “cheaters method” to create a very recognizable 3 toned portrait that takes a fraction of the time. Some patterns lend themselves to carving the 3 tones in a different faster way. I’ll show you that in the 3rd pumpkin carving lesson. Then, in the 4th carving lesson, I’ll show you a new easier way to carve complex portraits. People who see your pumpkin portrait carvings will think that you are a true artist! Even if you can’t draw, paint or sculpt. You will learn how to best store your pumpkin carvings to keep them fresh looking and you’ll learn several ways to light your pumpkin portraits. 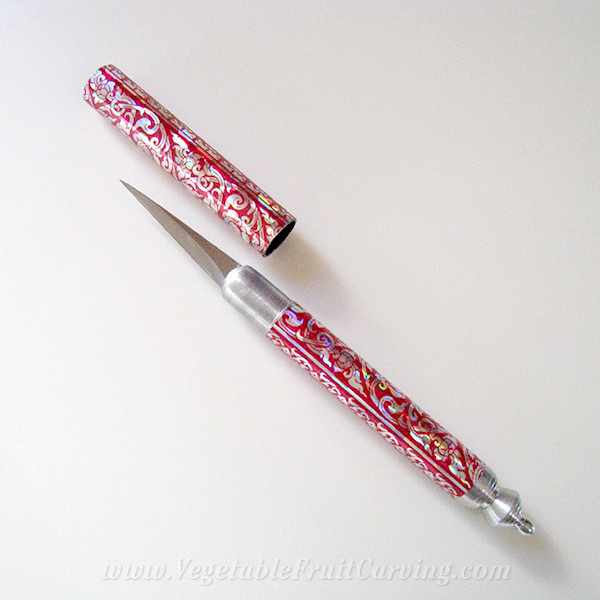 I’ll even provide you with a few patterns that I carve in the lessons so that you can carve along with me. You will Amaze Your Friends and Family with Your Pumpkin Portraits! 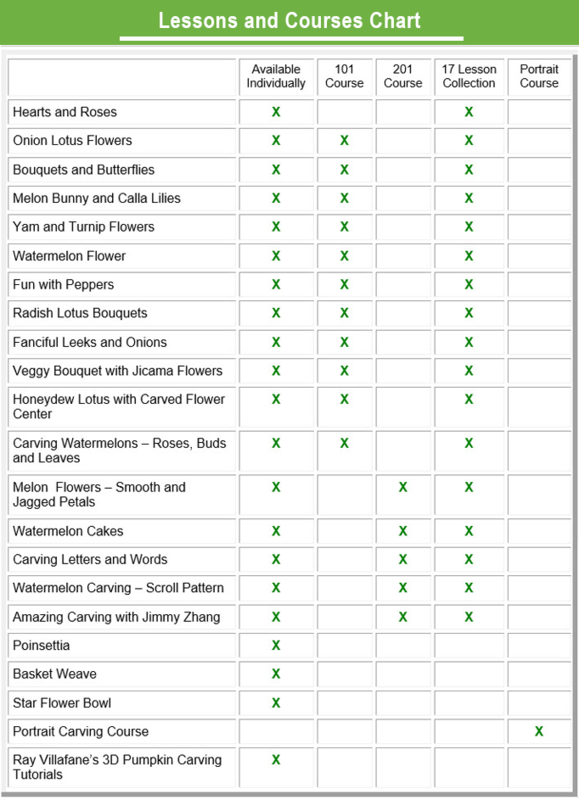 By the time you complete even the first carving lesson, you will be amazing your friends and family. I promise you that. And, don’t be surprised if people start asking if they can hire you to carve pumpkin portraits for their events. You’ll see. Donna’s 1st ever pumpkin carving portrait. When this child’s parents saw this carving, they hired Donna to carve it again for Halloween. To test out my lessons, I asked a friend to try her first pumpkin portrait. 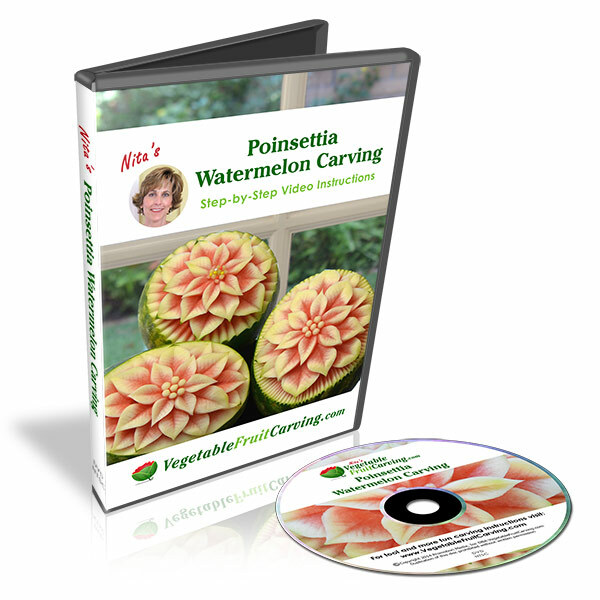 Although we’ve been friends for years, she had never expressed any interest in learning to carve fruits and vegetables. She had never done any type of food carving other than your typical basic American Jack O’ Lantern. You know, the ones with the triangle eyes and the big toothed smile. She was very pleased with her first attempt. So was I. And, by the way, in case you were wondering, I did not carve any of her first pumpkin. I showed her how and she did it all on her own. That evening, she took her pumpkin to a party at the home of the girl who’s portrait she carved. The girls parents were so excited about it, they offered to hire her to carve another for Halloween! Who know, maybe this will might happen for you, too. You wouldn’t be the first of my students to get inspired to start a business. ..I AM GETTING LOTS OF ADMIRATION AND …WAOW! !..from my friends.after showing them my curvings learnt from u…always looking forward for ur new curvings ! !..again thanking u. Regards. Close up of portrait carved in pumpkin as taught in 2nd half of lesson #2. Note the many shades of light and dark that make it appear more 3 dimensional. Detailed Video Instructions for carving that show action details that books with photos and words cannot communicate. Learn How to Avoid the Most Common Mistakes and how to avoid them and fix them. 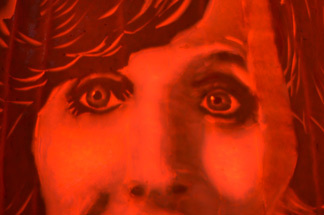 You will learn the #1 secret to great pumpkin carving portraits that makes the difference between success and failure when carving a recognizable portrait. Learn what to look for when choosing a photo that will make an excellent pumpkin carving pattern. How to take your own photos that will make ideal portrait patterns. You will learn what tools to use and how to use them. You will learn how to best hollow out your pumpkin (please don’t cut the top off and hollow out before you carve your portrait. You will learn several ways to best light your pumpkin portrait for maximum display appearance. 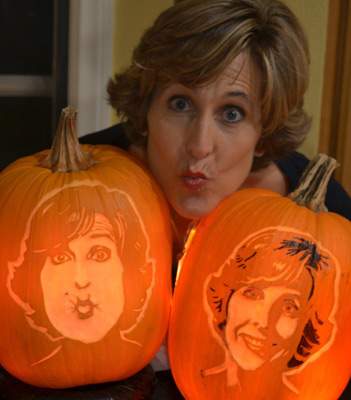 How to fine tune your pumpkin portrait carving. 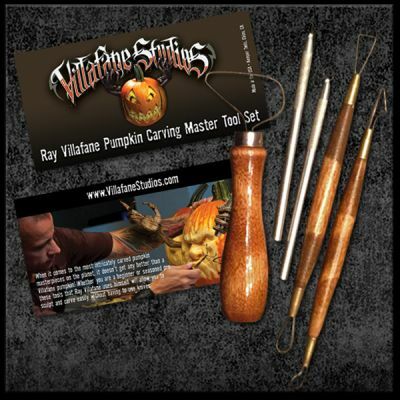 You will learn how to best store your carved pumpkins to keep them as fresh as possible. You will be getting all the important basics right away. Your skills will progress to intermediate and advanced. 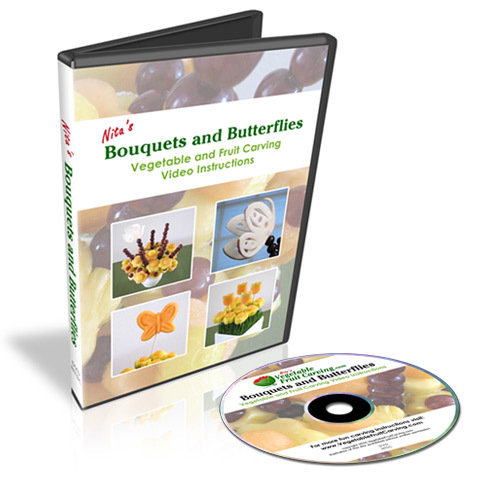 Online Version of Video Course Lets You Get Started Today! 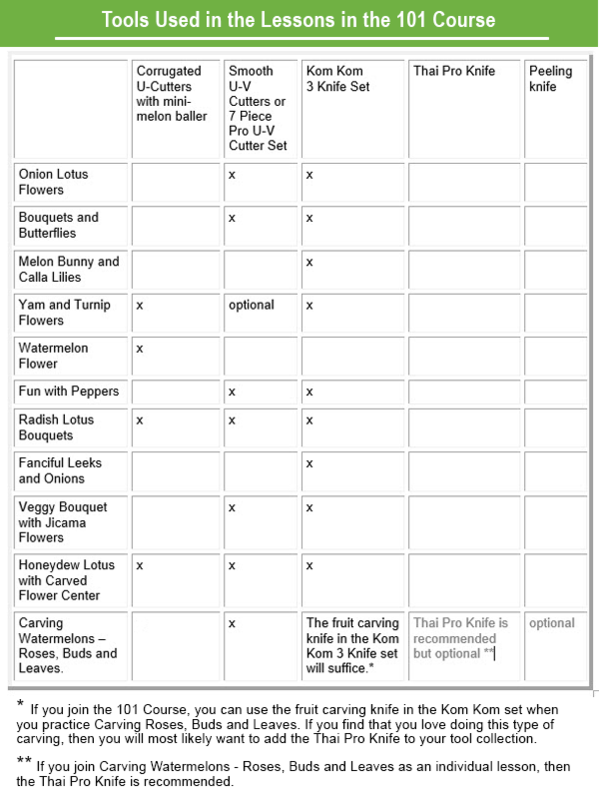 You can pay hundreds of dollars for one day of live pumpkin carving classes. They can cost up to $350 to $650 for one day’s class! It may sound crazy but it’s true. My video lessons teach more more than could be taught and practiced in one a live one day class. More like 4 to 5 days. With my Portrait Carving video course, you can learn at your own pace, at your own convenience. 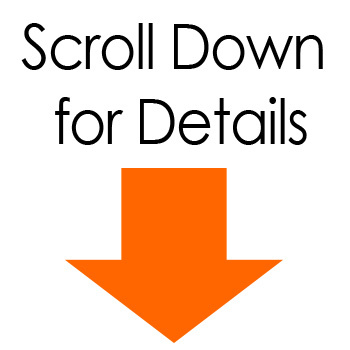 You get a front row, close up view, with clear audio and easy to follow, step by step instructions. You will never miss a thing. and if you get distracted or forget, you can always replay the lessons at any time. You can’t do that in a live lesson. By the way, there is no expiration date for the online lessons. And for those of you with tablet computers, you’ll be happy to know that you can conveniently watch the lessons on your iPad or other tablet wherever it’s most convenient for you. Certificate of completion is available to those students who send photos of all the completed projects in the course. Certificate is suitable for framing with embossed gold seal. There is no expiration date for the online access. 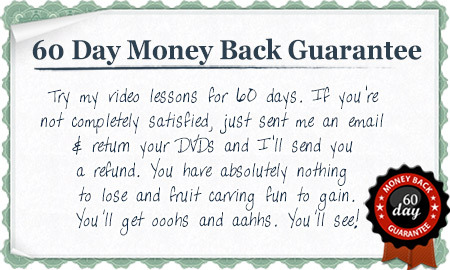 I’m so confident that you will love my lessons, that I give a 60 day money back guarantee. So join now. You’ve got nothing to lose and lots of pumpkin carving fun to gain. You will impress yourself with what you can carve. Plus you’ll win the admiration of family friends and clients. You’ll see. ….your videos are inspiring and you explain in a concise and clear way with a “personal” touch. Kind regards, Chin Forsberg – Sweden. 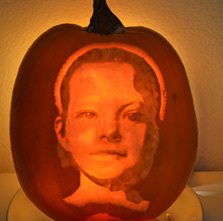 Get started with your first pumpkin carving portraits today! 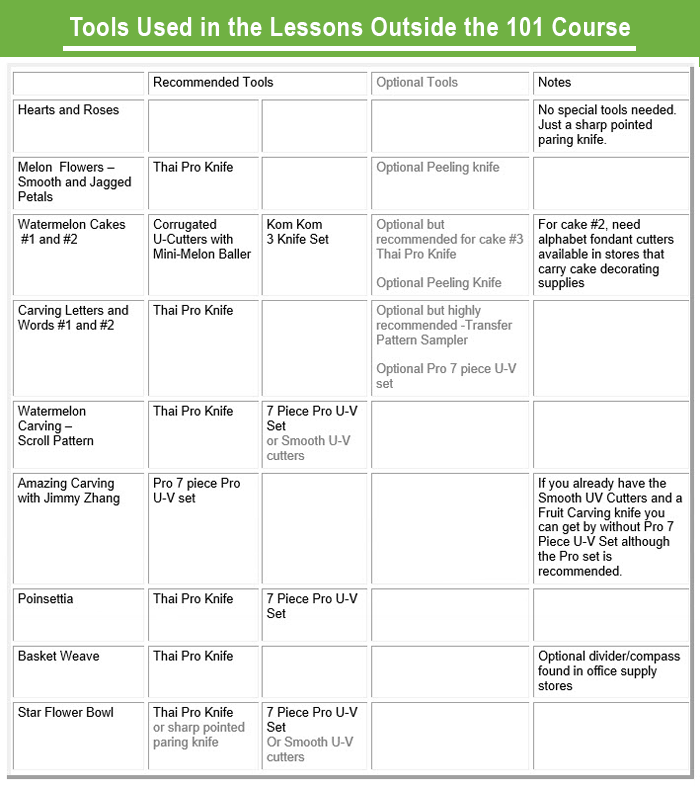 To see the tools recommended for the Pumpkin Portrait Course, click on the “Additional Information” tab above the “Product Description” or look in the section below titled, “Related Products”. 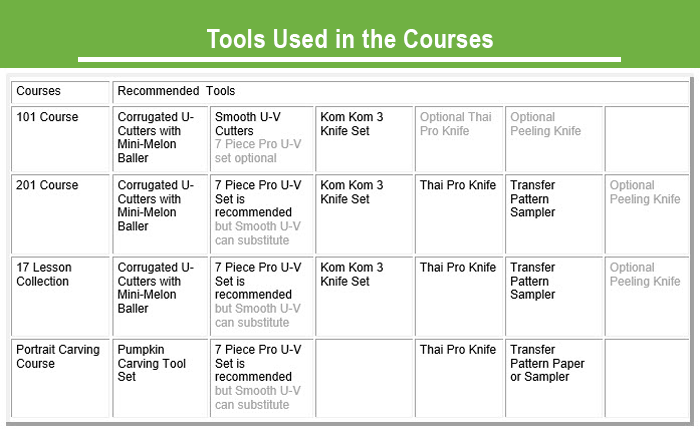 You will also see more specifics about tools within the Course. 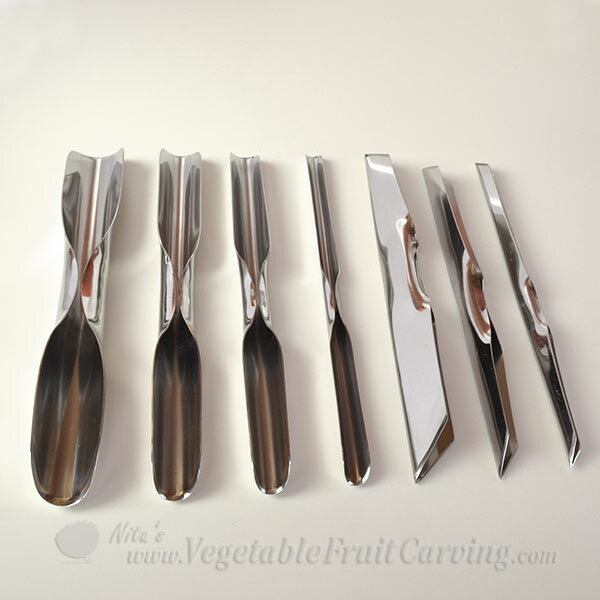 You may also like using an Exacto knife or Exacto Knife set #X5282 available are hardware stores and craft stores. 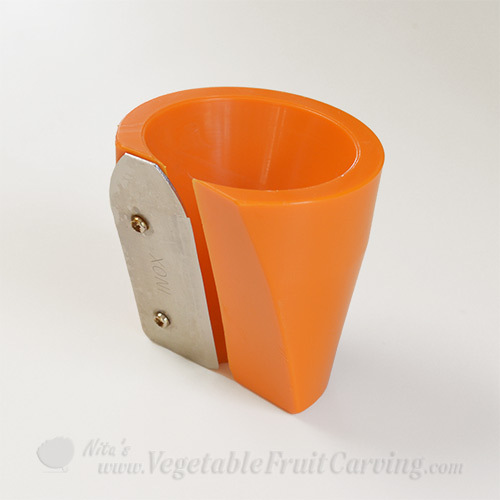 You can add items to your cart from the section below named – "Related Products", Or, click on shop link in green bar near top of page. i really enjoyed the the pumpkin carving course and have completed a few portrait pumpkins and one watermelon. I am just starting I have carved two projects. I am very impressed with the instructional materal. I would give it and Nita ten stars if I could.